Do you like to get presents? How about opening up your dinner? I am a fan of gifts of all types (yes, my birthday is coming up – 46 years old!). If you give me a gift of food, I will be quite happy and even more thrilled if it is healthy. Though, chocolates will never be turned away at my house. My kids were given these gifts at dinner without any explanation. They are always bugging me with, “What’s for dinner?” so I told them they were getting roasted snail bottoms. They usually stop asking when I say “snail bottoms”. This is a fun recipe to mix it up and (unless you don’t read the recipe) – you can’t go wrong. Have you tried food in foil? Preheat oven to 400 F. Place asparagus in the middle of a large piece of foil. Layer salmon over asparagus. 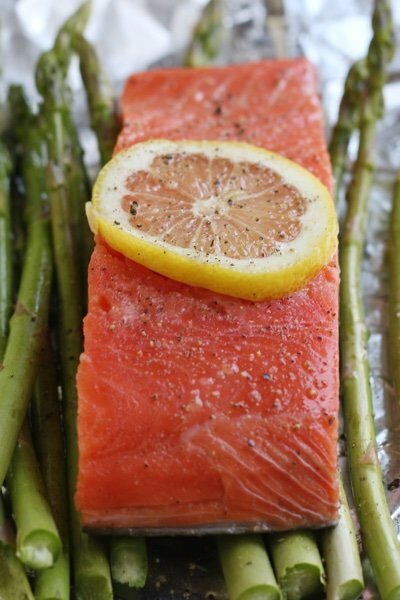 Slice lemon in half and squeeze one half of lemon over the three salmon fillets. Slice the other lemon half thinly and layer the slices on top of the salmon. Sprinkle with salt and pepper. Fold over foil and place on a rimmed baking sheet.Bake for 15-20 minutes or until asparagus is tender. I'm not sure if this is "in foil" or "on foil." Do you enclose the fish fillets or place on top of foil? Sounds delicious. I enclose & tent so the food steams. I grill in foil lots & love it!! Should this be set on a baking sheet when in the oven? so do you have all three pieces in one one foil packet, with the asparagus or split it up amongst three; and then is the 395 calories for all 3 pieces or one? I do a version of this with Chicken. A layer of sweet potatoes that have been tossed in a little oil and salt and pepper, top with black beans and red onions (corn too if you have some), top with chicken breast, then salsa, and about an ounce of cheese. Wrap and bake at 400F for about 20 minutes. Sprinkle with green onions and cilantro and serve with sour cream on the side. WOW , I LOVE this idea, I know it has been around for a long time, but haven't thought about it. So could you do cod instead of salmon? Love the chicken recipe from Catherine! Doing it! Would love to see more ideas on the "foil topic"! My brother-in-law makes the BEST salmon (on the grill and otherwise) and he often makes it in foil like this!! I have to do this. Thanks! 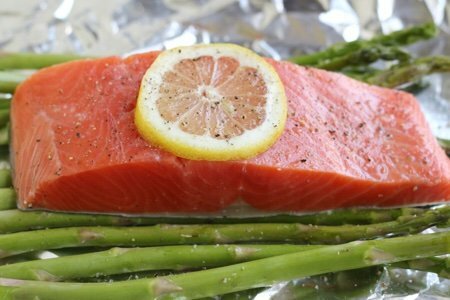 I like cooking salmon in foil packets -- it helps with the smell. I prefer to cook mine with some sort of sauce. I've done teriyaki sauce & I've done a smear of light mayo followed by a smear of ketchup, plus some diced onion or onion flakes. I'm making that chicken recipe tonight! Yum! In your recipe it states: 1 pound asparagus, tips broken off. I'd break off and discard the thicker and woody stalk bottoms, not the tender tips. I try to avoid cooking with foil due to the aluminum factor being unhealthy. Parchment paper is good alternative. A friend did this for a dinner party the other night. She used parchment paper that she had brushed with olive oil on both sides first. Fun when everyone at the table opens their package! Kraft sends me emails all the time and they just did a whole series of "foil packets" some were ones I never even thought of - have been doing this for years - as a weight watcher it is a wonderful way to go every once in awhile. Really enjoy your daily blogs. Great, common sense, ideas!! I do a similar thing but I use parchment paper. I toss my veggies of choice with a tsp of olive oil and spices of choice then I place the salmon on top. I spread a small amount of Dijon mustard on the fish then I wrap it up and bake 400 degrees for about 20-30 minutes. If I am real ambitious I will also make a whole wheat spaghetti pasta that I toss with olive oil, garlic and fresh herbs and place it on the bottom of the parchment and lay the fish on top with dijon and put veggies on top and wrap in packets. A true "meal in one". When salmon is on sale here I will make up these packets, bake them and then freeze them in ziplock and take them out as needed for a quick meal. I love the answer of "snail bottoms!" I'm going to use that with my kids. hardly any cleanup! What a bonus! This is just the kind of simple fish dish I've been looking for recently, thanks! My local supermarket has some neat stuff which is parchment-lined foil (foil on the outside to retain the heat, I presume, and parchment on the inside so the food doesn't stick and I can still say I cooked my fish "en papillote"!). It's no doubt cheaper to just use a layer of parchment and a layer of foil, but what the heck! @JuneBug: How do you reheat your frozen salmon meals? I have an exhausting job with pretty long hours, and I rarely have time or energy to cook during the week. I prep on weekends and freeze meals but it never tastes that good. I think I'm doing it wrong! (I'm a terrible cook). @Jayde: I keep the parchment packets wrapped up in the ziplock. When I want to have it for dinner I place packet on plate and defrost either in fridge(if I remember to take it out )or I use the microwave on defrost/lowest setting for about 5 minutes then I reheat the packet on 80% for about a minute or so until it is just heated through...don't over heat it or it will make the salmon/fish/chicken like jerky!!!!! FYI I am really lazy so I don't even take the skin off for the initial bake, I take it off gently when I plate it. I just love this website Snack-Girl your are the best!!!!! !